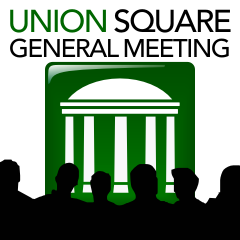 The Union Square Association Board requests your attendance at a special meeting to discuss and vote on several key issues that are time sensitive and impact the neighborhood. This Association meeting will be at our usual location in the Neighborhood Design Center, 1401 Hollins Street, at 7:00 pm. Please come out and let your voice be heard on these issues.